All our personnel in Australia are volunteers. 100% of all your donations go to our projects in Cambodia. Welcome to Matesabroad; over the last ten years we have continued to improve our programs and with the support of our volunteers our graduating students are now outperforming the local government schools and our communities are working towards independence. We choose to remain a small organisation for exactly these reasons – we are able to keep our administrative costs low and specifically direct 100% of donations where they are most needed. We are able to remain focused on our families and we do what we do well. A lawyer in a past life, John is the Director of our foundation and his management expertise and enthusiasm is the driving force behind the success of our programs. John visits Cambodia several times each year, personally overseeing our programs, monitoring each budget and ensuring that Matesabroad maintains strong relationships within each community. Lou originally trained and worked as a teacher and is now an internationally accredited management system auditor and consultant. She monitors, assesses and reviews our programs to ensure that our money is being spent effectively, we are meeting our targets and that our systems are continually improving. Katherine had the vision and compassion to inspire the formation of the Matesabroad Foundation. She is now an experienced educator who oversees a strong team of Australian and Cambodian teachers in the development and implementation of our schools program. In 2001, Delphine moved to Cambodia, drawn by the need to discover the country of her birth and her father’s home country. As a little girl and war was emerging in Cambodia, she and her family escaped to find refuge in Switzerland, her mother’s country. The urge to “return to Cambodia to help” inspired Delphine in building a career as a humanitarian professional working in war-torn areas including Bosnia, Rwanda, and Columbia, returning to Cambodia in 2001. 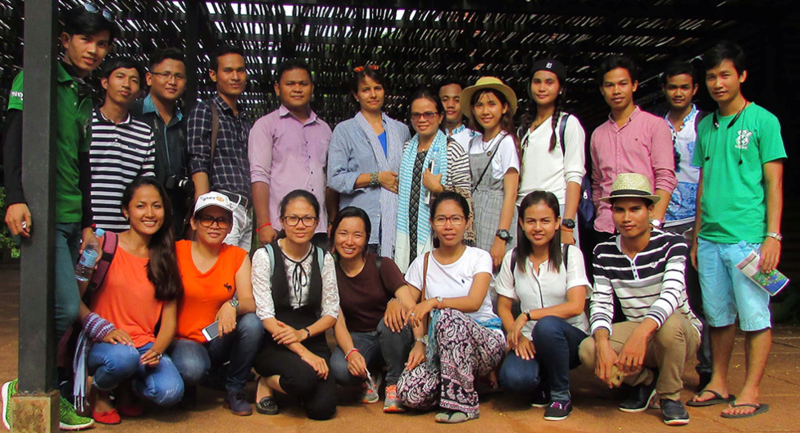 After fifteen years of working for multiple NGOs, Delphine’s conclusion is that Cambodia’s development lies in the hands of its youth. Delphine’s leadership ensures EYC provides essential education and development opportunities for some very marginalized but deserving youth. A former student, volunteer, Team Leader, Assistant Teacher, School Manager, and Program Manager, Synoeun has made numerous contributions to the organization through her involvement in leadership development of students and programs for youth over the past twelve years. In 2015 she returned from studying one year at Bridgewater State University in the USA. She is finishing her degree in Media Communications from Pannasastra University of Cambodia and has stepped into a major management position for EYC as Program Director overseeing all EYC operations. Synoeun wanted to give back to EYC for the opportunities it provided to her, and we are lucky to have her skills, leadership, and perspective. Samnang or “ Mr. Lucky” [ Samnang means Good Luck in Khmer] has been with us from the start. He is our right hand man. His answer to any concern is always “no problem” and we are indeed lucky to have him on our team. Samnang is the transport manager in Phnom Penh and also assists with a myriad of other tasks to ensure that everything goes smoothly on each immersion trip. With over 50% of staff made up of current and former students, the team strongly represents the individuals and communities we serve. The team of paid staff and volunteers are dedicated to helping young people gain the confidence to achieve their goals. They are passionate about supporting their communities and contributing to a positive future for Cambodia.